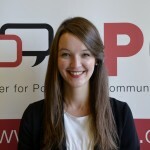 Franziska is a postdoctoral researcher at the Amsterdam School of Communication Research, where she works on the ERC-funded project on EUROPINIONS, led by Prof. Claes de Vreese. She earned her PhD from the University of Vienna in Austria, where she was part of the Advertising and Media Effects research group. In her thesis, she investigated the content and effects of right-wing populist political advertising strategies in Western Europe. Her research interests center around political communication effects, experimental methods, and the impact of visual communication in various mediated context. In addition, she worked on a project studying the content, mechanisms and effects of food product placements in children’s movies, and is engaged in work on exposure to cross-cutting information in old and new media environments. Prior to her work in Vienna, Franziska earned a Master degree in Communication Science from the University of Erfurt in Germany.